A Ultimate Air-Boat Tours discounts - Hotels Etc. Take a break from the hectic theme parks and enjoy the natural beauty Central Florida has to offer. On this one hour tour, Captain Jim Passmore will take you on an adventure through the lakes and wetlands surrounding the Orlando area.Save Over 10% on Air-boat Rides! Explore the beauty of the Florida Everglades and Central Florida on Orlando Airboat Tours. Join Captain Jim Passmore on an airboat adventure that will take you through the serene waters of Lake Toho as you learn about the surrounding natural habitat. With hotel pick-up (1 Hour Airboat Tour only) and a location close to the Orlando and Kissimmee areas, exploring the environment is easier than ever before. Your tour guides are native Central Floridians with a deep knowledge of the area and its ecosystem. Bring your camera and be ready to take pictures of incredible gators, bald eagles, coyotes, marsh cows and more. 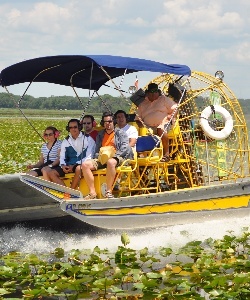 Orlando Airboat Tours is great fun for the entire family and a unique way to spend your time in Orlando!